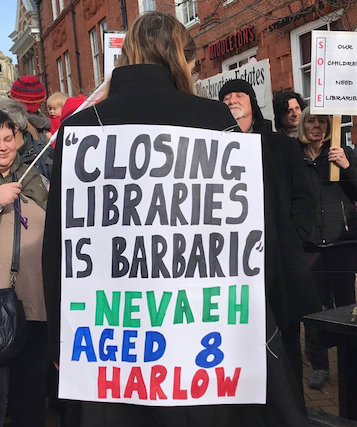 AN estimated 1,000 people marched on County Hall on Saturday (February 9) to protest against County Council plans to drastically reduce the Library Service in Essex. In a bid to slash costs by £3.7m, 25 of the county’s 74 libraries have been earmarked for closure by 2024. This includes three of Harlow’s five libraries – Mark Hall, Tye Green and Great Parndon. A large and passionate group from Harlow took part in the demonstration including teachers, parents, children and retirees. Harlow resident, Emma Batrick who attended the protest and who is one of the local organisers of Save Our Libraries Essex (SOLE), said; “I’ve spoken to so many people in the lead up to today’s demonstration who have shared what their local libraries mean to them – people who credit their local library with their degrees; people who view their local library as their last shred of independence, and teachers who rely on taking children to the local library otherwise they would have to fund the school library out of their own pockets. 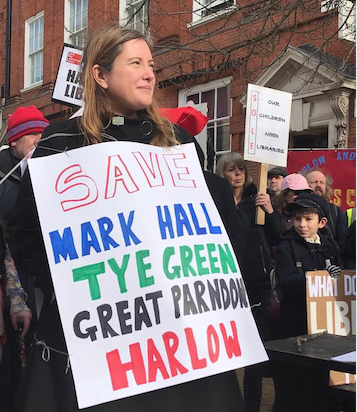 Also at the demonstration was Harlow Labour Councillor Tony Edwards who told the crowd that if Harlow lost three out of its five libraries we would go from having one library per 17,000 people to one library for every 40,000 people. He also described the town centre library as a “disgrace and in desperate need of investment”. Anyone wishing to support the campaign to save Harlow’s libraries is encouraged to take part in the County Council’s Consultation by visiting https://libraries.essex.gov.uk/libraries-consultation/complete-the-survey/ You can also do the survey over the phone by calling 0345 603 7639. DEADLINE 20 FEBRUARY. Facebook users are encouraged to join the Save Our Libraries Essex (SOLE) Facebook group to keep up to date with latest meetings and events. 2 Responses to "Harlow protestors join massive county wide rally against cuts to Essex Library service"
Yes, I agree that the closer of local libraries are barbaric but the so are increases council taxes which Harlow residents have faced ever since the Labour party became the administrating party back in 2012. The only reason they froze it last year was because the Tory county council administrating party increased it. This year it’s the Two faced Harlow Labour administration party that’s increasing the council Tax, so councillors can gain more in their monthly Allowance for doing jack for the Harlow residents. Ever considered trying ‘grammarly’ DPL?